Many adults in the suburbs and outskirts of London regularly commute to work, alongside my dad, who used to work at an office in North London. The majority of people regularly have frustrations with our services, including my dad, who has said: “The constant delays and cancellations are frustrating; why can’t the companies and government do more to prevent these situations?” This inspired me to ask my local MP for Esher and Walton, Dominic Raab, a few questions regarding our train services to understand the answers to this simple question: What is the government doing about our trains? Question: We pay and pay a lot of money into our train services, why so much? Mr Raab: First, the government has taken action on rising rail fares. In the 2013 Autumn Statement, the Chancellor of the Exchequer announced that, from 2014, rail fares would be capped at the rate of Retail Price Inflation for the first time in a decade. 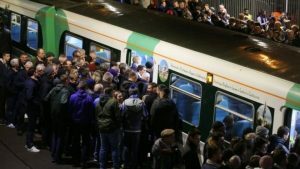 It has also removed the previous flexibility that allowed train operating companies to increase individual fares by up to 2% more than the permitted average increase, which means that no regulated rail fare can now rise above the rate of RPI. The above cap will continue until at least 2020. Over the next five years, the government’s cap on rail fare increases will save the average season ticket holder around £425. My reflections: Personally, I think that this cap is needed. With salaries growing slower than costs, we need as many incentives to stem the rise of train fares. Many people don’t understand that more money is needed to modernise our railways, with quite a few parts of our railway infrastructure still from the Victorian era. We urgently need new parts for quite a few sections of our railway. With the South West Trains suburban line being one of the busiest sections of railway in the country, it regularly requires maintenance. As you see, more and more money needs to be inputted. But what about after 2020, and the cap the Conservatives instilled. What will happen then? Will the rail fares increase by 10% a year? We need closure on this matter. At least an agreement with another party if they have a majority in The House of Commons. Question: What are the most pressing issues regarding the railway you think need to be quickly addressed? Mr Raab: As your MP, it is one of my top priorities to get a better deal for Elmbridge rail passengers, given the fares we pay. Nationally, rail fares are helping to fund the biggest programme of rail investment since the Victorian era, delivering new state-of-the-art trains, better stations and hundreds of miles of electrified track. Elmbridge must get its fair share, and I am working hard to make sure that is the case. My reflections: I agree with what Mr. Raab said here, that many of our services are being improved, but not fast enough. With tens of thousands of engineering workers in the UK, but are we waiting too long for improvements for our services? As I said, the suburban line is very congested. More trains = more capacity. I understand that new trains are being introduced on the South West Trains network, but is this fast enough? Question: Are you for or against the strikes held by Southern Rail staff? Mr Raab: On Southern Rail, both I and the government condemn any industrial action that will disrupt passengers’ journeys and the disruption we have seen over Driver Controlled Operations (DCO) is unnecessary. Over 60 per cent of GTR’s services already operate without conductors and DCO trains have been safely operated on our rail network for over 30 years. In peak times around three DCO trains leave a London terminus per minute, full of customers, perfectly safely. It is used in other countries around the world including Germany and Japan. My reflections: Whilst we wait for the staff at Southern Rail to Southern Rail has lost quite a bit of money that possibly could have been spent on our services. Question: What is our money currently being used on across our railway? Mr Raab: Importantly for the long-term, the government has approved Crossrail 2, the £27 billion project that, by taking capacity off existing SWT services, will help to substantially ease overcrowding affecting our local rail services. Having met with Network Rail’s lead officials on Crossrail 2, it became clear that Esher and Walton is set to be one of the biggest beneficiaries from this project. Through the construction of additional track further up the line towards London, the scheme would take trains off the South West mainline, releasing enough capacity for 15 extra train services in the morning peak hours, helping to ease overcrowding on all our commuter services at stations such as Esher, Hersham and Walton on Thames. Crossrail 2 would also provide passengers with a direct rail link to a range of central London destinations such as Victoria, Tottenham Court Road and Euston, as well as Waterloo and Vauxhall. It would give passengers the ability to interchange with the Crossrail 1 services to Heathrow, Paddington, the City and Canary Wharf. Crossrail 2 trains will also be faster than our current rolling stock, shortening journey times to central London by around fifteen minutes. My reflections: Crossrail 1 and 2 are going to be lifelines for an ever growing population in the UK. With passenger numbers growing every single year, the pressure on suburban services will be relieved, with fewer delays due to lower passenger numbers. ‘Shortening journey times to central London by around fifteen minutes’ will be a lifesaver for many commuters to London travelling in the mornings. Lower journey times will mean more trains, and more capacity. Question: Do you think Brexit will push up our train prices even further? Mr Raab: Around 45% of rail fares are ‘regulated’. So, changes are controlled directly by the Secretary of State, who takes into account the level of RPI inflation. The remaining part of the fare is set by the rail operator, and subject to business conditions. There is no reason why Brexit should lead to any material change to the operating conditions of our rail operators, who in turn shouldn’t need to increase their prices as a direct result of Brexit. CPI inflation remains well below the Bank of England’s target rate of 2%. I hope this provides you with a degree of reassurance. My reflections: This is a sigh of relief for many people. If train fares increase any further, that would spell a problem for many travelers. It definitely is ‘a degree of reassurance’ for thousands and thousands of people a day. But 55% of the rail fare is set by the operator, and this may possibly be a question of profits over customer satisfaction. Question: Capacity is a big issue on trains these days. What is being done to try and reduce the amount of overcrowding? Mr Raab: While there is still much work to be done, there have been a number of improvements in our local rail network that will benefit Elmbridge passengers in the years to come. This includes the lengthening of platforms 1 to 4 at Waterloo and the work to bring the former Eurostar platforms 20 to 24 at Waterloo back into use for domestic services should be completed by December 2018. This will provide a 30% increase in capacity across the South West Trains (SWT) network, the biggest increase for decades and which will help overcrowding. My reflections: ‘30% increase in capacity’. Wow. This will be one scheme that has the possibility to pay off well, and if it does, the train services will be drastically improved. Question: We quite regularly hear about people trespassing on the lines. This causes considerable delay to thousands of people a day. What is being done to prevent these sort of events happening? Mr Raab: With regards to trespassing on the railway, there are a number of options available to try and prevent unwanted or dangerous access. Network Rail works with the British Transport Police to take appropriate enforcement action against those who are trespassing. This includes prosecution alongside a range of educational measures such as school visits and communications campaigns. Network rail also conducts regular maintenance and works to repair any faults as quickly as possible. My reflections: Is this enough? Could higher fines and more stringent punishments help to prevent these issues? can be done to improve our railways at once. We just have to wait.